In May, Truro Cathedral Choir will record a CD of my work for Regent Records. This is an exciting prospect for a number of reasons: having been lucky enough to have done discs with a mixed-treble cathedral choir (St Mary’s Cathedral, Edinburgh), with adult professionals (the BBC Singers, the State Choir Latvija and Polyphony) and adult amateurs (the Vasari Singers and St Jacobs Chamber Choir in Stockholm), the one thing I haven’t done is a whole recording with a traditional all-male choir like the one I sang in as a child in Canterbury Cathedral; it is also the case that I have had a very longstanding relationship with Truro Cathedral Choir and it will be great to celebrate and create a record of that collaboration; but most importantly, the choir are really good! In fact they were really good when I first got to know them in the mid-90s and they have continued to get better and better under successive directors Andrew Nethsingha, then Robert Sharpe and now Christopher Gray. My admiration and respect for cathedral musicians is boundless. I know from experience how very hard the trebles work, with a perpetual routine of choir practice, school, choir practice, service, as well as all the other commitments (musical and non-musical) they have to take on. (I also know from experience how exhilarating it can be to sing in a top-flight ensemble day after day.) The men in the back rows are incredibly dedicated – they certainly don’t do it for the money! – and theirs is a punishing schedule too. One of the pieces we will record was commissioned by Simon Gay to mark his retirement from Westminster Abbey Choir after 30 years, and Truro’s Senior Lay Vicar has sung with them for over 30 years too. That kind of faithful service is truly remarkable. At the end of February Truro Cathedral Choir gave a concert in the cathedral with organist Luke Bond and saxophonist Joel Garthwaite. The progamme was entirely of living composers including James MacMillan, Eric Whitacre and several pieces by me that they will record. There was a palpable buzz in the audience as the singers took the stage, the sense that this was going to be an exciting evening, which it was. The choir sang with enormous technical accomplishment throughout but, more than that there was a rare verve, an energy and intensity that were quite thrilling. 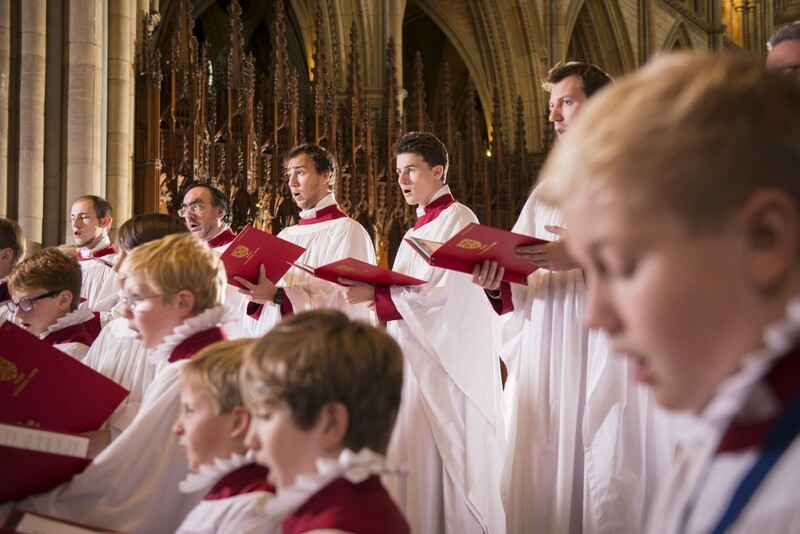 Of course the boys are…well…boys, but many of the Lay Vicars are young too and the choir has a youthful panache that is very compelling. In truth, Truro Cathedral Choir are rather cool. And this will be a very cool CD.